Dunlop/MXR M-101 Phase 90. Guessing on the serial number, this unit may have been manufactured around 2003 or 2004. 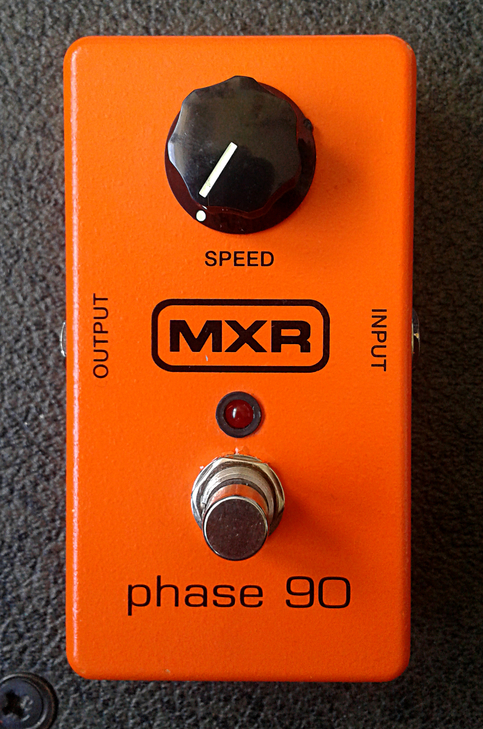 The classic, original MXR Phase 90 is a fine specimen in vast number vintage effects that have earned their milestone status in guitar effects. So it is a classic for good reason. However, the greatness ended when original MXR went bankrupt in mid 80’s. Later, Dunlop Manufacturing bought the rights for MXR brand and sunk their hands into the catalog of great designs. I’ve heard stories where one well known guitar brand from the western world was producing lower quality instruments than their daughter brand, which manufactured guitars in asia. So these cheaper sticks were simply way better than the ones the mother company was able to produce. So what do you think was the mother company’s solution? Order the daughter company to lower their quality, so they could keep selling their product, which had a brand of higher value. This resulted in tarnishing of daughter brand’s reputation. Now you might ask how does this have anything in common with this pedal? I’ll tell you. In one way. These Dunlop/MXRs have very little to do with original MXR pedals. I know a number of people who have made a decision to never touch another MXR pedal after they have tried Phase 90. The board inside these current production is not the same board we find in pre-Dunlop era MXR Phase 90. I’ll get to the sound of this box a bit later, but here’s a photo of the board. Modern, with amount of layered ground fill that will blow your mind. Basic design doesn’t differ all that much between pre- and post-Dunlop era boxes. But it differs enough to transform the sound to something completely different. No. It’s not the ground fill i mentioned. It’s not the use of modern through hole components like metal film resistors and multilayer ceramic capacitors. It’s the circuit topology. The four JFET based phasing stages are intact. Excellent design in vintage units have a nice, smooth, lush phase to them. Someone at Dunlop thought that the classic could be better if there was a path to feed the already phased signal back to the beginning of the phase stages. Sure. This will make the phasing effect more drastic. Maybe even deeper. In this case it does kill the original beauty of the design. Completely. As you can see in the photo above, there’s a resistor missing right above the output jack. That’s the “feedback resistor” that makes the modern Phase 90 what it is. 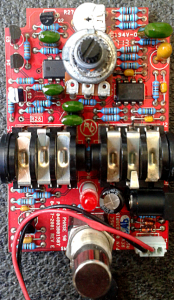 That resistor is easy enough to remove, but how would you feel about buying a mid price range pedal and having to mod it to get it even remotely useful? For me, i can say with absolute certainty that i’m not going to buy current production Dunlop/MXR Phase 90 as a new unit. Never. In reality, they are selling you an image and feel of this good old effect, but the insides are not up to that image. I’m not going into the fact that Dunlop also sells “Script” versions of these circuits. For a premium price. Of course. Oh. A fun fact. Danelectro Pepperoni Phaser is 1:1 circuit copy of this badly modernized phaser. 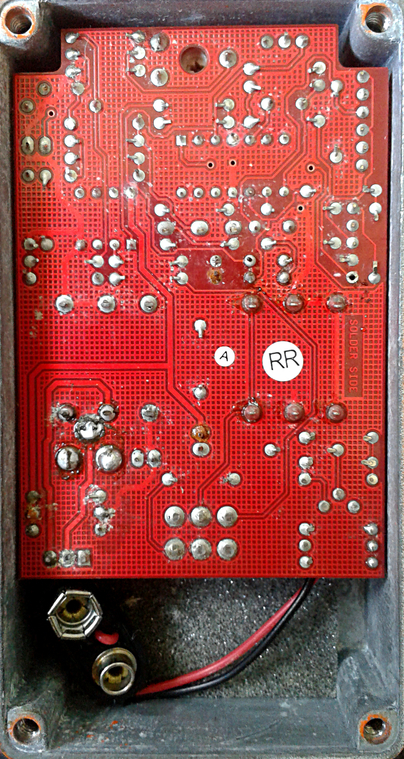 Before removing the R22 resistor – horrible. Mids get boosted due to this internal feedback and the circuit isn’t designed to handle this boost. And while it simply can’t take, we get very ugly distorted overall tone that can’t handle even the low output vintage styled single coil pickups. This is where everything goes wrong. Kid in your neighborhood has read in guitar magazines that his/her guitarist idol used MXR Phase 90 on the record he/she loves. Next thing you know, this kid needs to get a Phase 90. And when it sounds nothing like the one used on that album, what do you think this kid’s reaction will be? Maybe he/she just hates MXR for his/her misfortune. After all, that’s what it says on top of the box. MXR. But if (and when) we snip the R22 out of the circuit, we get rather close to the unspoiled tone of the original Phase 90. The distorted mids are gone and mellow swirl takes over once again. Conclusion – as stock? Horrible and not worth the 30-50 money units these sometimes go for as used. As modded? Way better. Still not exactly great, but good. This entry was posted on Thursday, October 30th, 2014 at 02:23	and is filed under Dunlop. You can follow any responses to this entry through the RSS 2.0 feed. You can skip to the end and leave a response. Pinging is currently not allowed. Just to clarify, the feedback resistor is the R28, as you can see in the labeled image. You can clip the resistor out at both ends if you like, or just cut one end and raise it enough to break the connection. Do not desolder the resistor!!! it is very easy to damage it (leaving you with a dead pedal). A pair of small cutting pliers is all you need, and will keep the pedal safe and working fine. Entries (RSS) and Comments (RSS). 24 queries in 0.072 seconds.